Cakewiches are basically a sandwich made of cake and frosting, quite possibly the best sandwich you will ever have! I made adorable little gingerbread boys and girls out of cake and sandwiched them together with creamy vanilla cream cheese frosting. They couldn't be more adorable and they are a great alternative to classic gingerbread man cookies. You can use red and green colored sprinkles, perfect for Christmas parties, or use rainbow sprinkles for a cute Winter treat. 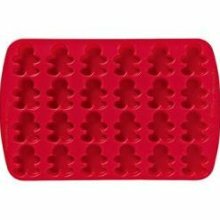 This is what the pan I used looks like (they are available online, at baking supply stores, and in the baking aisle of arts and crafts stores this time of year). Bake gingerbread cake in the silicone pan, creating little gingerbread kid mini cakes. Prepare cream cheese frosting according to directions. Sandwich a layer of frosting between two gingerbread kid cakes. Pour nonpareils over the frosting sandwiched between the two cakes. Pipe the eyes, smile and buttons on with frosting, using a very small round decorating tip or toothpick, on the top of your cakewich. You can also try using a toothpick to dot on the details with melted white chocolate so the face doesn't smudge. Use two heart sprinkles for the bow, with their tips touching. Use a round sequin sprinkle to connect the two heart tips with frosting by placing it on top in the center as shown below.